An AirAsia flight from Indonesia to Singapore carrying 162 people has vanished. (Does this seem to be happening more frequently in recent years?). There are no theories other than "bad weather" regarding its disappearance. 4. Neptune in Second House. 5. Neptune square ruler of Ascendant. 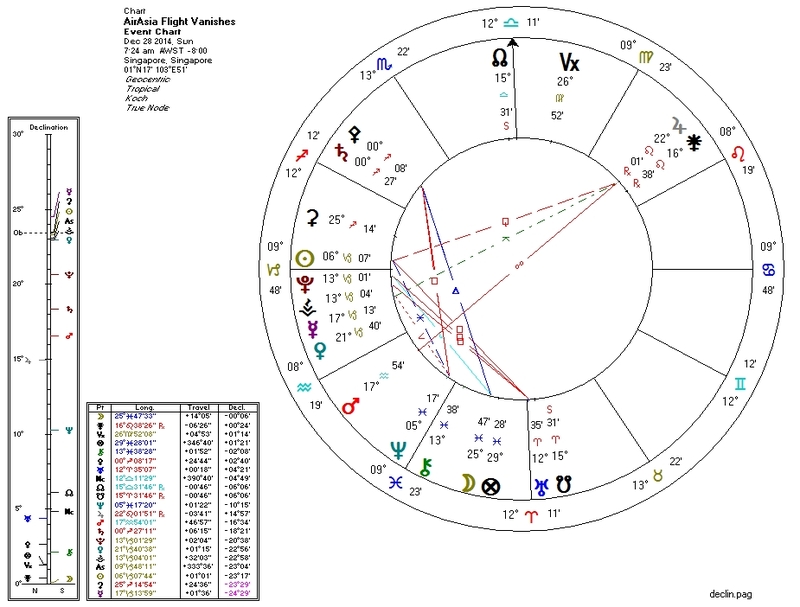 We also have Jupiter (travel) as the "handle" of the chart's "bucket" formation in the Eighth House (death) and Mercury (short-distance travel) conjunct Pluto (death again). Uranus and the South Node at the IC might suggest instability (Uranus) and mysterious forces (South Node) at play with mother Earth (IC). We hope, of course, for the best possible outcome.